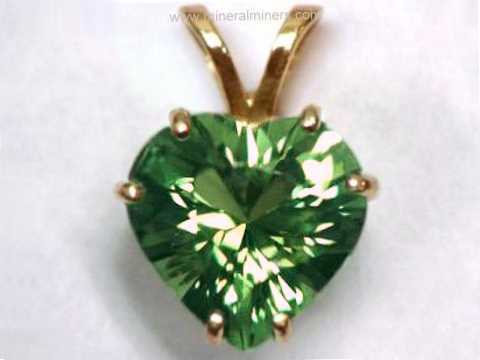 Try our Green Tourmaline Crystals Satisfaction Guarantee - compare our green tourmaline prices and our superior quality. Select any green tourmaline crystal image below to enlarge it. 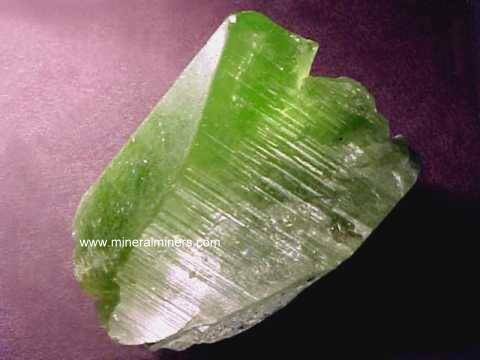 This natural green tourmaline rough specimen has medium green natural color. This transparent green tourmaline has some small gem-grade areas. This natural green tourmaline crystal section has fine medium green natural color. This transparent green tourmaline has a flawless area at one end that will yield a one carat flawless faceted gemstone. The photo at left is a back-lit view, see also an end view of this gem-grade tourmaline crystal. This genuine green tourmaline crystal is 0.75" tall x 0.5" x 0.5"
This small size naturally terminated green tourmaline crystal has medium green color. The terminations and prismatic faces of this natural green tourmaline crystal are in good overall condition. This tourmaline specimen is completely natural and has not been heated or treated in any way. It is transparent, and at the base is shows a core of pale pink tourmaline surrounded by a green tourmaline rim (watermelon tourmaline). See an end view that shows the pale pink core of this natural color watermelon tourmaline crystal. This genuine green tourmaline crystal is 0.95" x 0.9" x 0.85"
This naturally terminated green tourmaline crystal has medium green natural color. The termination and prismatic faces of this semi-transparent green tourmaline crystal are in very good overall condition with only a few minor abrasions. 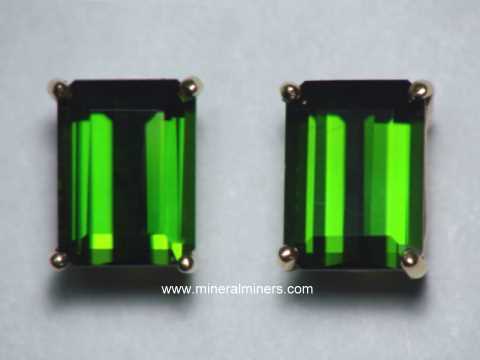 The photo at left is a back-lit view, see also a front lit view of this natural color green tourmaline crystal. This genuine green tourmaline crystal is 1" tall x 0.8" x 0.7"
This naturally terminated green tourmaline crystal has medium green natural color. The terminations and prismatic faces of this green tourmaline crystal are in very good condition. 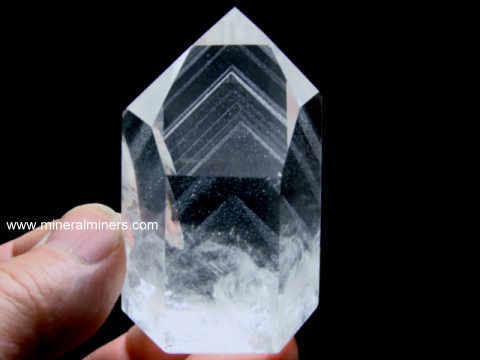 It is transparent with several facet grade areas inside! There are tiny sparkling mica crystals encrusted on the termination. This gem grade tourmaline crystal is one inch long. It has natural color zones; it is brown at the base and then becomes gray-purple, and then green, then blue-green, and then green again right at the naturally terminated tip! It has not been heated or treated in any way. It is a naturally terminated tourmaline crystal. This rare quality tourmaline is 40% facet grade. It appears to be black, but when held to a light the beautiful dark colors are visible as shown. 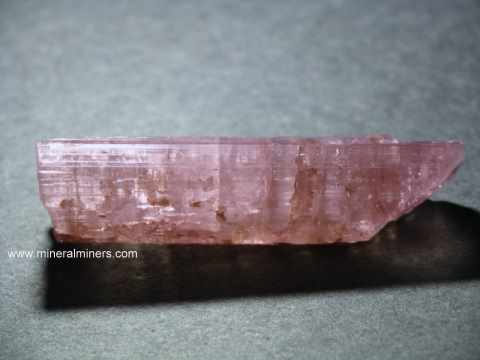 This slender gem grade tourmaline crystal is 1.5 inches long. It has natural medium-dark green color with a naturally terminated tip. It has not been heated or treated in any way. This rare quality tourmaline is over 80% facet grade. This green tourmaline crystal appears to be almost black, but when held near a light the beautiful color is easily visible as shown. This gem grade green tourmaline crystal has beautiful green natural color; it has not been heated or treated in any way. It is a naturally terminated tourmaline crystal. This rare quality tourmaline is completely clean inside throughout its length. It appears to be almost black, but when placed near a bright light as shown the beautiful color is easily visible. This natural tourmaline crystal could be set into jewelry just as it is or it could also be faceted into 3 carats of flawless gemstones. This gem grade green tourmaline crystal has beautiful medium-dark green natural color; it has not been heated or treated in any way. It is a naturally terminated tourmaline crystal. This rare quality tourmaline is completely clean inside throughout 90% of its length with a few inclusions only right at the tip where the color becomes blue. It appears to be almost black, but when held to a light as shown the beautiful color is easily visible. This natural tourmaline crystal has a good shape for cutting a large gem, and it would yield a single flawless faceted gemstone weighing 15 carats! This gem grade green tourmaline crystal has beautiful medium-dark green natural color; it has not been heated or treated in any way. 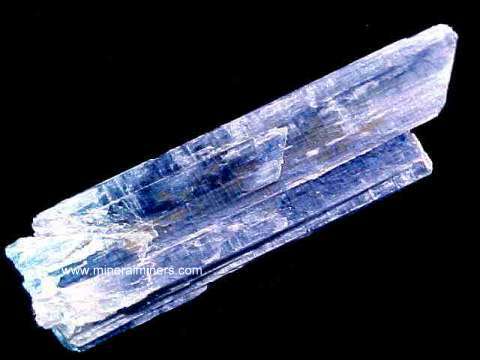 It is a naturally terminated tourmaline crystal and the color becomes blue right at the crystal tip as shown. This rare quality tourmaline is completely clean inside throughout 75% of its length with a few inclusions only at the base of the crystal. It appears to be almost black, but when held to a light as shown the beautiful color is easily visible. The entire central section of this natural tourmaline crystal is flawless, and it would yield a single flawless faceted gemstone weighing over 8 carats. See also a full view image of this fine collector quality green tourmaline crystal. Tourmaline in Matrix Specimen Dimensions: 4" x 2.4" x 1.6"
This natural pegmatite specimen weighs 1/2 pound. There are several green and blue-green tourmalines with mica on semi-transparent quartz crystals. Tourmaline in Matrix Specimen Dimensions: 3.2" x 2.5" x 1.9"
This natural pegmatite specimen has a matrix of white albite intergrown with quartz crystal with several green tourmalines exposed on its surfaces. The photo at left shows a close-up of a 0.7 inch long transparent green tourmaline crystal that bridges across a couple of quartz crystals. See a full view image of this green tourmaline crystals in matrix specimen. See also an opposite side view of this green tourmaline in pegmatite specimen. Tourmaline in Matrix Specimen Dimensions: 3" x 2.3" x 1.7"
This natural pegmatite specimen has a matrix of lavender-gray lepidolite mica with white albite and several transparent green tourmaline crystals. See another view of this pegmatite specimen with green tourmalines. Tourmaline in Matrix Specimen Dimensions: 5" x 2.7" x 1.8"
This natural pegmatite specimen is a partially terminated semi-transparent quartz crystal with numerous green and blue-green tourmaline crystals and a small amount of lavender lepidolite mica. Many of the tourmaline crystals have gem-grade transparency. The photo at left shows this pegmatite specimen held up to a light. See a full front view of these green tourmaline crystals in quartz. Tourmaline Specimen Dimensions: 2" x 1.4" x 1"
This black tourmaline specimen has a thin layer of beautiful cat's eye green tourmaline over some of its surfaces. This chatoyant green tourmaline is translucent to semi transparent, with beautiful green-gold natural color. Tourmaline in Matrix Specimen Dimensions: 2.1" x 1.7" x 1.3"
This natural pegmatite specimen has a matrix of transparent quartz crystal with mica. 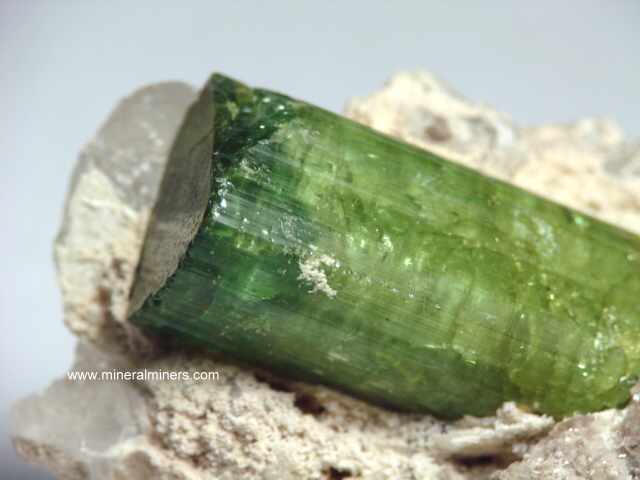 There are several transparent green tourmalines exposed on its surfaces. The largest green tourmaline crystal is 1.1 inches long. Some areas of the green tourmaline crystals have gem grade transparency. Tourmaline Specimen Dimensions: 2.7" x 0.75" x 0.6"
This natural tourmaline crystal specimen is semi-transparent with natural grayish green colors when held to a light as shown. Tourmaline Specimen Dimensions: 2.8" x 0.75" x 0.6"
This natural tourmaline crystal specimen is semi-transparent with natural grayish green colors. See also an image of this green tourmaline crystal held near a light. Tourmaline Specimen Dimensions: 2.9" x 1.6" x 1.5"
This natural tourmaline crystal specimen is semi-transparent with natural grayish green colors. When held to a light, the edges glow. See also an image of this green tourmaline crystal specimen held to a light. Tourmaline Specimen Dimensions: 2.3" x 1.7" x 1.3"
This natural tourmaline specimen consists of two intergrown partially terminated black and green tourmaline crystals with some white albite feldspar. See also an opposite side view of these intergrown green tourmaline crystals. Tourmaline Specimen Dimensions: 1.8" x 1.4" x 0.8"
This natural tourmaline specimen consists of two intergrown semi-transparent green tourmaline crystals with with a small amount of lepidolite mica. 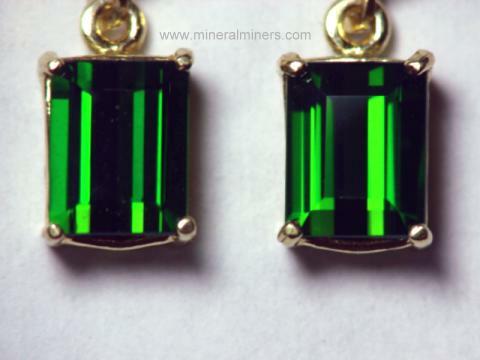 The tourmalines appear almost black, however when held near a light their beautiful green and blue-green colors are visible. See also another image of these intergrown green tourmaline crystals. Green Tourmaline Crystal Specimen, 492 carats! Tourmaline Specimen Dimensions: 2.4" x 1.6" x 1.3"
This natural green tourmaline crystal specimen is semi-transparent with natural grayish green colors. When held to a light, the edges glow. See also an image of this green tourmaline crystal specimen held to a light. These naturally terminated dark green tourmaline crystals have 100% natural color! They appear almost black, however they actually have a beautiful deep green body color with dark brown naturally terminated tips when placed against a light as shown. They are ideal for making cabochon gems or lightly included faceted gems, and for small carvings as well. They also make very nice natural color green tourmaline specimens for mineral collections and metaphysical use. We have them available in several approximate sizes. Please see below to place an order. Tourmaline Mineral Specimen Dimensions: 1.25" x 1" x 0.8"
This natural dark green tourmaline specimen is a partially terminated crystal section. It appears black, however it has some transluscent to semi-transprent areas along its edges showing rich green natural color when held to a light. Tourmaline Mineral Specimen Dimensions: 1.2" x 1.1" x 0.9"
This natural color dark green tourmaline mineral specimen is a partially terminated crystal with some broken surfaces. 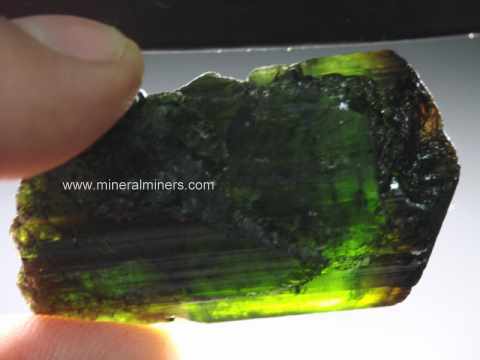 This tourmaline specimen appears black, however it is actually translucent to semi-transparent along its edges where it shows natural green color when held near a light. Tourmaline Mineral Specimen Dimensions: 1.3" x 1.1" x 0.8"
This natural dark green tourmaline specimen is a naturally terminated crystal with some abraded areas. It appears black, however it has some transluscent to semi-transprent areas along its edges showing rich green natural color when held to a light. 1.75" x 1.1" x 0.8"
This natural dark green tourmaline specimen is a partially terminated crystal. 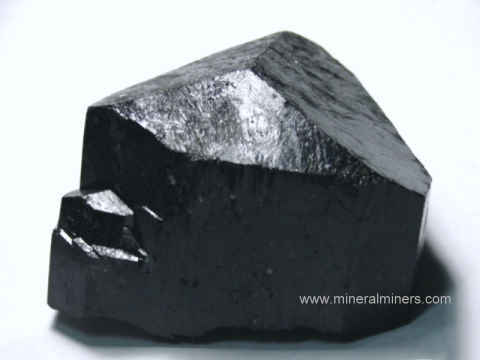 It appears black, however it has some semi-transparent areas showing rich green natural color when held to a light. Tourmaline Mineral Specimen Dimensions: 1.5" x 1.1" x 0.9"
This unique tourmaline mineral specimen is a naturally terminated dark green tourmaline crystal with some broken and abraded surfaces. 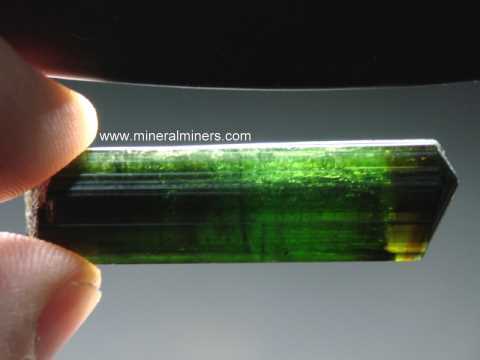 This tourmaline specimen appears black, however it is actually translucent to semi-transparent along its edges where it shows rich green natural color when held to a light as shown. This natural dark green tourmaline mineral specimen is actually a group of several intergrown naturally terminated crystals with some abraded surfaces. 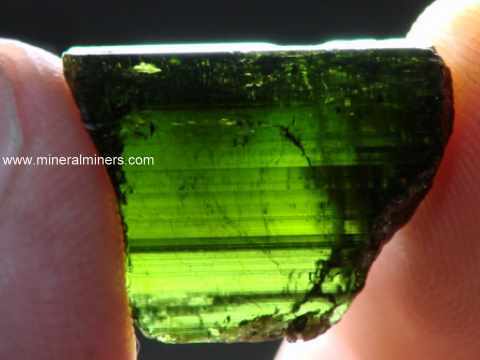 This tourmaline specimen appears black, however it is actually translucent to semi-transparent along its edges where it shows rich green natural color when held to a light as shown. See also a full view image of this tourmaline mineral specimen. 2.6" x 1.8" x 1.7"
This dark green tourmaline specimen is actually a cluster of intergrown tourmaline crystals. It is mostly translucent with some semi-transparent areas showing rich green natural color when held near a light. It also has some small areas with natural blue color. Tourmaline Mineral Specimen Dimensions: 2.2" x 1.5" x 1.25"
This natural green tourmaline specimen is a partially terminated crystal section with a green tourmaline rim surrounding a brownish green core. This tourmaline specimen is opaque to translucent with some semi-transparent areas along its edges. See an upright view of this natural green tourmaline crystal specimen. 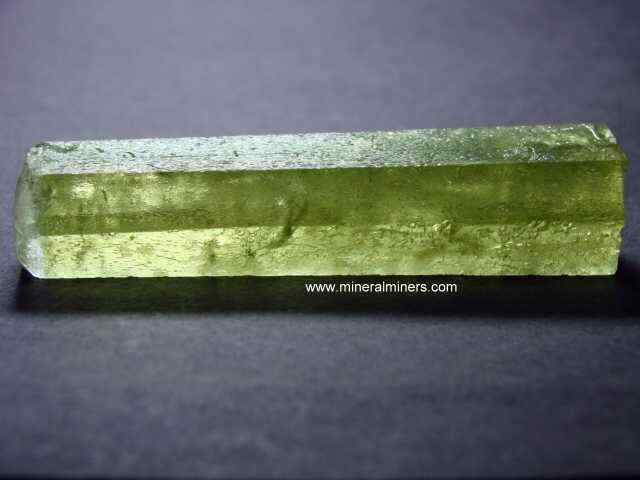 See also an opposite side view of this natural color green tourmaline crystal. Tourmaline Specimen Dimensions: 2.8" long x 2.4" x 0.9"
This natural dravite tourmaline specimen has a relatively flat shape. It is semi-transparent with several cabochon gem grade areas. It has different colors when viewed under daylight versus incandescent light. 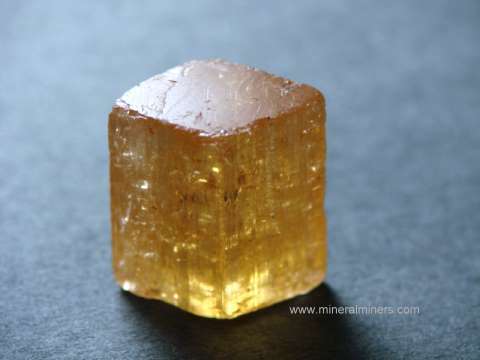 Under normal incandescent light it has golden-yellow colors, and under daylight (see photo at left) the colors change to shades of rich yellow green (100% natural colors - this natural dravite tourmaline is unheated and untreated). Green Tourmaline Specimen Dimensions: 1.9" long x 1.2" x 0.8"
This natural color dark green tourmaline mineral specimen is so dark it appears to be almost black. 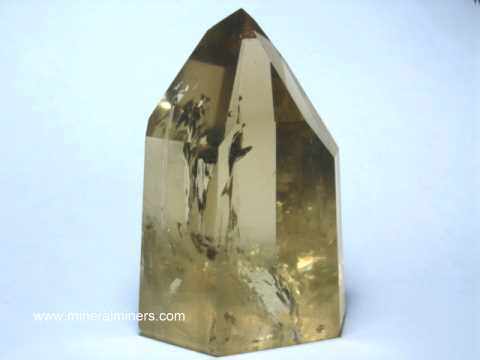 When held to a light, its beautiful green body color and brown color zone at the crystal tip is revealed as shown. See a front-lit view of this natural color green tourmaline mineral specimen. It has commercial cabochon grade transparency, and it would yield a dark green tourmaline cabochon gem weighing 50 carats! This natural green tourmaline specimen is a partially terminated crystal with some broken areas. It is mostly semi-transparent with dark green natural color. See also another back-lit view of this natural color green tourmaline mineral specimen. Green Tourmaline Specimen Dimensions: 0.9" long x 0.7" x 0.4"
This natural color dark green tourmaline crystal section is so dark it appears to be almost black. When held to a light, its beautiful green color and amazing cabochon gem grade transparency is revealed as shown. It has a large area of fine cabochon grade transparency with faint natural inclusions, and it would yield a 10 carat dark green tourmaline cabochon gem! This green tourmaline specimen is a crystal section with prismatic faces. It is transparent with dark green natural color. Green Tourmaline Specimen Dimensions: 0.8" long x 0.5" x 0.4"
This natural color dark green tourmaline crystal section is so dark it appears to be almost black. 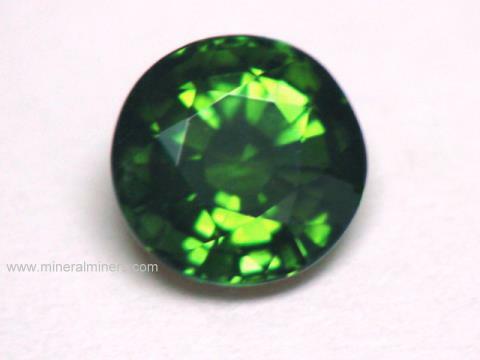 When held to a light, its beautiful green color and cabochon gem grade transparency is revealed as shown. It has good cabochon grade transparency with faint natural inclusions, and it would yield a dark green tourmaline cabochon gem weighing over 10 carats. This natural green tourmaline specimen is a crystal section with prismatic faces. It is transparent with dark green natural color. Green Tourmaline Specimen Dimensions: 1.2" long x 1" x 0.5"
This natural color dark green tourmaline crystal is so dark it appears to be black. When held to a light, its beautiful green body color and brown color the crystal tips is revealed as shown. This collector quality tourmaline crystal specimen has a large area with fine cabochon gem grade transparency where it would yield a dark green tourmaline cabochon gem weighing 25 carats, or a 15 carat faceted gem with very faintly visible inclusions. 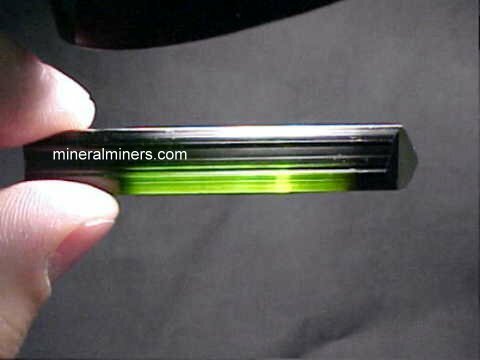 This natural color green tourmaline crystal has natural prismatic faces in good condition, and the naturally terminated crystal tips show very interesting natural etching. See a close-up view of the naturally etched terminations on these intergrown tourmaline crystals. Green Tourmaline Crystal Dimensions: 1.8" long x 0.4" x 0.4"
This natural color dark green tourmaline crystal is so dark it appears to be almost black. When held to a light, its beautiful colors and transparency is revealed as shown. 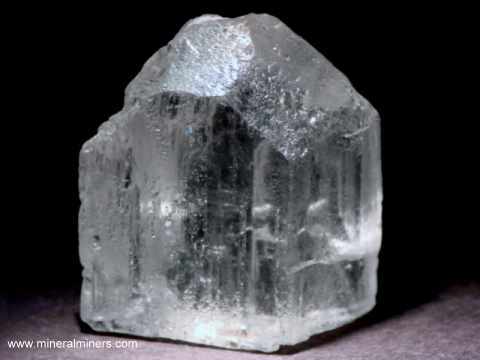 It is translucent at the base and becomes semi-transparent to transparent in the middle of the crystal. This natural color green tourmaline crystal has natural prismatic faces and terminations in good condition. See an opposite side view of this dark green tourmaline crystal. Dark Green Tourmaline Crystal Dimensions: 4.35" long x 0.35" x 0.3"
This long slender natural tourmaline crystal appears to be black, but when held up to a light this rare quality tourmaline actually has very dark green color at one end that grades into dark brown in the middle and then into very dark brown and finally black near the tip. This dark green tourmaline crystal measures 4.35 inches long, and it is naturally terminated with flawless gem-grade transparency in the green and brown portions when illuminated! It would yield 20 carats of flawless faceted green toumrmaline gemstones, and 10 carats of flawless faceted brown tourmaline gems. The prismatic faces and the terminations are in very good condition. Natural Dark Green Tourmaline Crystal dimensions: 5.8" long x 0.5" x 0.4"
This 5.8 inch long natural tourmaline crystal appears to be black, but when held up to a light this rare quality tourmaline is actually a very dark green color at one end that grades into dark brown toward the middle and then into very dark brown (appears black) near the tip. This dark green tourmaline crystal is naturally terminated, and it has large flawless gem-grade areas inside in both the green and brown portions that are visible when illuminated! This rare quality tourmaline crystal would yield 25 carats of flawless faceted green tourmaline gemstones, and another 25 carats of flawless faceted dark brown tourmaline gems! The prismatic faces and the terminations are in very good overall condition. See a view of this large tourmaline crystal with a light behind it. This natural pegmatite specimen has a microcline matrix with a small amount of albite and mica. There are several naturally terminated transparent quartz crystals with some dark green tourmaline crystals embedded in the quartz. Pegmatite Matrix Specimen Dimensions: 4.5" x 3.2" x 2.8"
This natural pegmatite specimen has a matrix of partially terminated quartz crystal with some albite, clevelandite, and purple lepidolite mica. 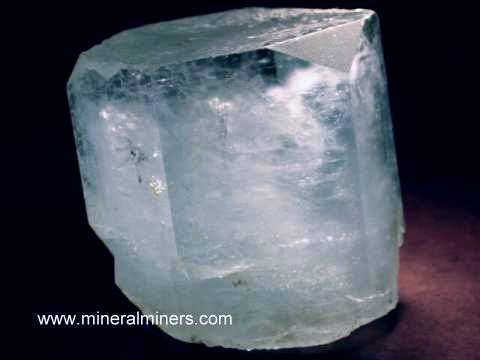 There are a few blue-green tourmaline crystals embedded in the quartz as shown at left. 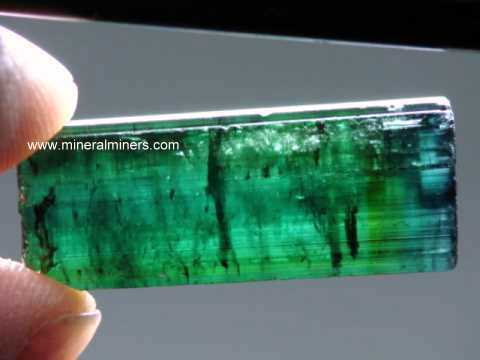 The largest blue-green tourmaline is 1.4 inches long, and it has a faintly purplish area as well. 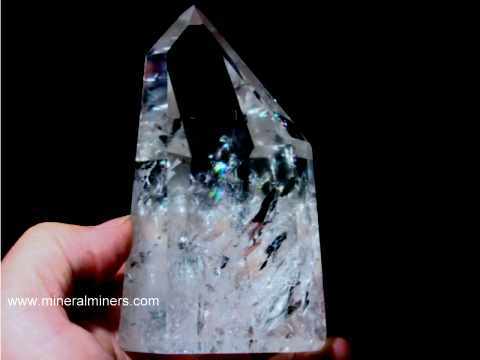 See a full view of this natural matrix specimen of tourmalines on quartz crystal. See also an opposite side view of this tourmaline on quartz crystal specimen. This genuine green tourmaline crystal is 4.2" long x 0.85" x 0.75"
This natural green tourmaline crystal section has medium-dark natural color. This green tourmaline specimen is semi-transparent. When held to a bright light you can see some light coming through the crystal (see a view of this green tourmaline held to a light). This unique tourmaline has a long slightly curving form. The photo at left is a close-up, see also a full view of this green tourmaline crystal. Pegmatite Specimen Dimensions: 4.5" x 3.7" x 2.4"
This natural pegmatite specimen was mined at the Cruzeiro mine in Brazil. This tourmaline specimen is completely natural and has not been heated or treated in any way. It has a matrix of translucent quartz with some gray-lavender lepidolite mica and a 1.7 inch long green tourmaline crystal that is a watermelon tourmaline at one end as shown in the close-up photo at left. See a full view of this natural tourmaline in matrix specimen. 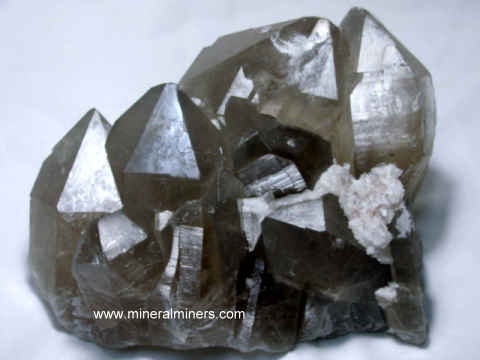 The opposite side shows some terminated areas on the quartz and it is about half covered with lepidolite mica. See an opposite side view of this tourmaline in matrix specimen. Pegmatite Specimen Dimensions: 5.5" x 3.5" x 2.5"
This natural pegmatite specimen has a matrix of semi-transparent to transparent quartz with albite and clay minerals and some beautiful green tourmaline crystals. See a full view of this natural specimen of green tourmaline crystals in matrix. There are more green tourmalines on the opposite side. See also an opposite side view of this natural mineral specimen of green tourmaline crystals in matrix. 4.3" x 3.4" x 2.5"
This natural pegmatite specimen has several semi-transparent to transparent green tourmaline crystals measuring up to 2.5 inches long in a matrix of albite. This pegmatite specimen also has some semi-transparent pink tourmaline exposed around its surfaces. Pegmatite Specimen Dimensions: 3.3" x 2.2" x 1.7"
This natural pegmatite specimen has a matrix of albite and mica with a 2.5 inch long green tourmaline crystal exposed. See a full view of this natural specimen of green tourmaline in matrix. There is a partially exposed smaller green tourmaline on the back side as well. Pegmatite Specimen Dimensions: 5.2" x 3.5" x 2.7"
This natural pegmatite specimen has a matrix of quartz crystal with a small amount of clay minerals and mica. There are several green tourmaline crystals exposed around its surfaces, the largest measures 4.3 inches long with a 3/4 inch diameter! See a back view of this natural specimen of green tourmaline crystals in matrix. See also another view of these natural green tourmaline crystals in matrix. 5.6" x 5.5" x 4.3"
This natural pegmatite specimen has hundreds of green tourmaline crystals exposed on the surfaces of quartz matrix. 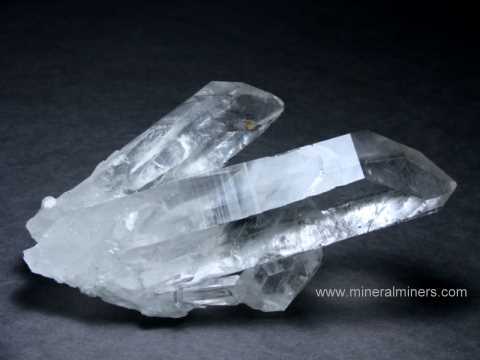 The quartz crystal is translucent to semi-transparent inside with some thin surface coatings of white milky quartz. The largest green tourmaline crystals on this specimen measure up to about one and a half inches long, and they do pass though the quartz as well as being on all its surfaces. See also another view of these natural green tourmaline crystals on matrix. This blue-green tourmaline crystal is 1.33" long x 0.5" x 0.5"
This naturally terminated blue-green tourmaline crystal has medium-dark natural color. The termination and prismatic faces of this semi-transparent tourmaline crystal are in good overall condition with some minor abrasions. The photo at left is a back-lit view showing the natural color zoning - notice the blue color zone at the tip! This genuine green tourmaline crystal is 1.8" long x 1" x 0.6"
This natural green tourmaline crystal section has medium green natural color. This green tourmaline specimen is a crystal section with prismatic faces. 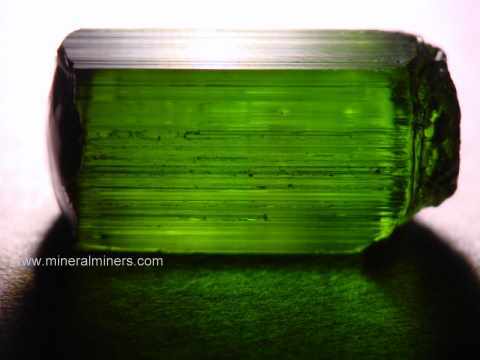 See an opposite side view of this natural color green tourmaline . There are crystal impressions on some surfaces. See another view showing some interesting natural surface features of this natural color green tourmaline crystal. This natural green tourmaline crystal section has medium green natural color. This transparent green tourmaline has flawless transparency throughout with no inclusions. The photo at left is a back-lit view. See an opposite side view of this flawless green tourmaline. See also an end view of this flawless tourmaline crystal. This natural green tourmaline crystal section has medium green natural color. This transparent green tourmaline has over 95% flawless transparency inside with just one inclusion separating two large clean areas. The photo at left is a back-lit view. See also an opposite side view of this gem grade green tourmaline. See also an end view of this flawless tourmaline crystal. 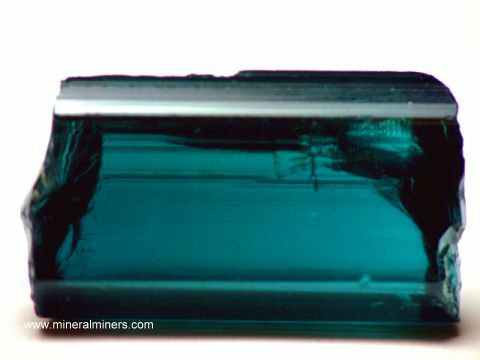 This natural tourmaline crystal section has medium blue-green natural color; it not been heated or treated in any way. This beautiful tourmaline crystal section measures 1 inch long. It appears to be almost black, but when held to a light the beautiful color is visible. The tourmaline has fine cabochon gem grade transparency, with faint natural inclusions throughout its length. 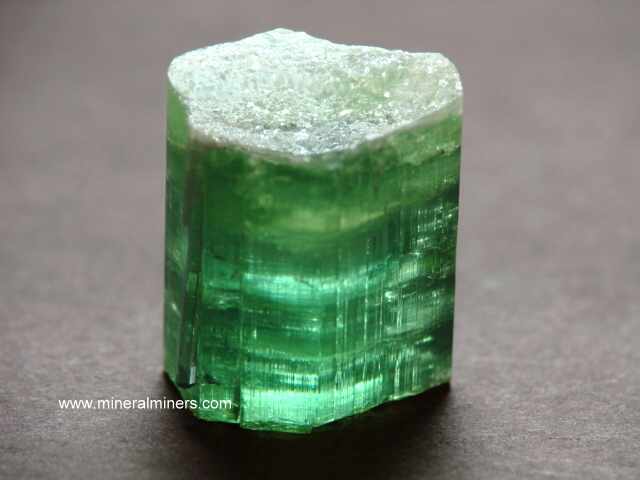 This is a great collector specimen of gem grade blue-green tourmaline just as it is, although if cut it would yield a 20+ carat lightly included gem with fine medium blue-green color! See also a view from a different side of this natural green tourmaline gem grade rough. This gem grade blue-green tourmaline crystal has fine medium-dark blue-green natural color; it has not been heated or treated in any way. It is a naturally terminated tourmaline crystal. This rare quality tourmaline is almost completely flawless throughout its length with just a few very faint natural inclusions. It appears to be almost black, but when held to a light as shown the beautiful color is easily visible. This natural tourmaline crystal could be set into jewelry just as it is or it could also be faceted into a few carats of small flawless gems. This gem grade blue-green tourmaline crystal section appears to be almost black, but when back-lit as shown the beautiful color is easily visible. This facet grade tourmaline has some very faintly visible natural inclusions inside. 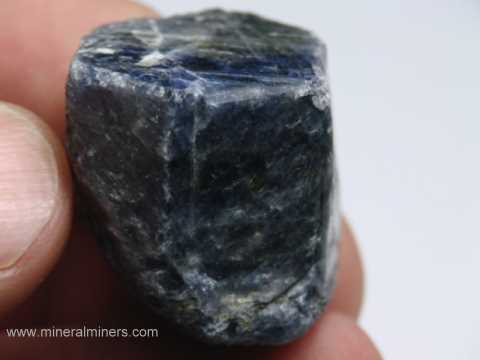 It will yield a 5 carat faceted gemstone with fine medium-dark blue-green natural color that would have very faint natural inclusions that would only be visible when examined closely. This is a natural color tourmaline - it has not been heated or treated in any way. See also another view of this natural blue-green tourmaline gem rough. This gem grade blue-green tourmaline crystal is naturally terminated. It appears to be almost black, but when back-lit as shown the beautiful color is easily visible. This rare quality tourmaline has a clean area at the larger end that will yield a 3 carat flawless gemstone with fine medium-dark blue-green natural color. 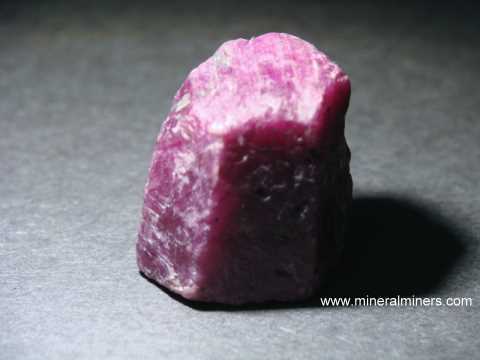 This is a natural color tourmaline - it has not been heated or treated in any way. See also another view of this natural blue-green tourmaline facet grade rough. This gem grade blue-green tourmaline crystal section has fine medium blue-green natural color; it has not been heated or treated in any way. It is a natural tourmaline crystal section. This rare quality tourmaline is 85% flawless, and it would yield a 4 carat flawless gemstone! See also a back side view of this natural green tourmaline facet grade rough. This gem grade medium blue-green tourmaline crystal has all natural colors; it is blue-green at its base then grades into green, and becomes blue right at the naturally terminated tip. It appears to be almost black, but when back-lit as shown the beautiful colors are easily visible. This tourmaline crystal has not been heated or treated in any way. This rare quality tourmaline is almost completely flawless throughout its length with a few faint shallow natural inclusions. This natural tourmaline crystal could be set into jewelry just as it is, or it could also be faceted into a few carats of small flawless gems. This gem grade medium green tourmaline crystal section has natural color; it is unheated and untreated. It appears to be almost black, but when back-lit as shown the beautiful color is easily visible. This rare quality tourmaline is completely clean throughout its length with no eye visible inclusions inside! This green tourmaline makes a great collector specimen of gem grade natural tourmaline just as it is, or it could be faceted into a single fine green tourmaline gemstone weighing 20 carats! Natural tourmaline dimensions: 0.85" long x 0.4" x 0.25"
Natural tourmaline dimensions: 0.9" long x 0.8" x 0.7"
Natural tourmaline crystal dimensions: 0.9" x 0.8" x 0.4"
Natural tourmaline dimensions: 1.3" long x 0.55" x 0.5"
Natural tourmaline crystal dimensions: 1.7" x 0.55" x 0.3"
Natural tourmaline dimensions: 1.1" long x 0.6" x 0.55"
Natural tourmaline dimensions: 1.5" long x 0.5" x 0.5"
Natural blue-green tourmaline dimension 2.1" long x 0.75" x 0.55"
Green tourmaline dimensions: 2.7" long x 0.6" x 0.6"
This natural color tourmaline crystal is naturally terminated with terminations and prismatic faces in excellent condition. This rare quality tourmaline crystal is lightly included with several clean facet grade areas inside. It has medium dark to dark green color with a light blue tip (100% natural colors - this tourmaline crystal is unheated and untreated). The photo at left is a back-lit view. 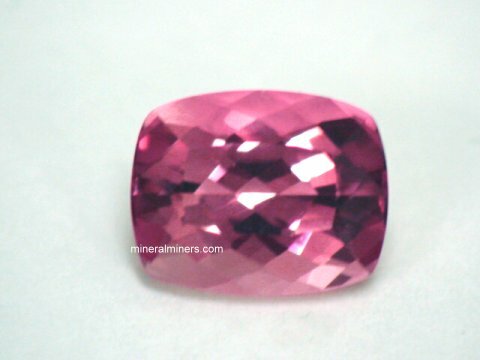 Our mineralminers.com special offer price for this rare natural color tourmaline crystal is $11/carat = $1804. Watermelon tourmaline in matrix specimen dimensions: 2.5" long x 1.4" x 1.3"
This natural tourmaline specimen has a 1.2 inch long watermelon tourmaline crystal on a pegmatite matrix of albite and partially terminated quartz. This tourmaline specimen is completely natural and has not been heated or treated in any way. The watermelon tourmaline in this specimen is translucent to semi-transparent. This watermelon tourmaline has natural colors as shown with a green rim partially surrounding a light pink core. 3.2" long x 2" x 1.4"
This natural tourmaline specimen has a 2.5 inch long watermelon tourmaline crystal in a pegmatite matrix of white albite and quartz. This tourmaline specimen is completely natural and has not been heated or treated in any way. The watermelon tourmaline in this specimen is translucent to semi-transparent. This watermelon tourmaline has natural colors as shown with a green rim surrounding a light pink core. See an opposite side view of this watermelon tourmaline specimen. 3.1" long x 1.9" x 1.4"
This natural color watermelon tourmaline specimen has several green tourmaline crystal sections intergrown with a semi-transparent quartz crystal matrix.This tourmaline specimen is completely natural and has not been heated or treated in any way. 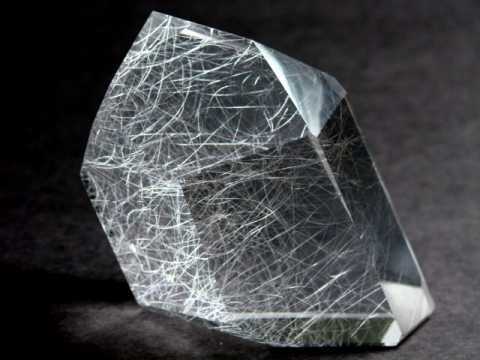 The quartz is naturally terminated. The watermelon tourmaline in this specimen is translucent to semi-transparent, and it measures 1.8 inches long. This watermelon tourmaline has natural colors as shown with a green rim surrounding a light pink core which is exposed towards one end. Tourmaline Specimen Dimensions: 1.5" long x 0.7" x 0.5"
This natural specimen of watermelon tourmaline was mined at Rubelita, Brazil. This tourmaline specimen is completely natural and has not been heated or treated in any way. It is a translucent natural crystal section with a reddish-pink tourmaline core partially surrounded by green tourmaline. Tourmaline Specimen Dimensions: 1.7" long x 0.9" x 0.6"
This natural specimen of watermelon tourmaline was mined at Rubelita, Brazil. This tourmaline specimen is completely natural and has not been heated or treated in any way. It is a translucent natural crystal section with a reddish-purple tourmaline core partially surrounded by green tourmaline on two sides. See also an opposite side view of this natural color watermelon tourmaline specimen. Tourmaline Specimen Dimensions: 1.4" long x 1.4" x 0.7"
This natural specimen of watermelon tourmaline was mined at Rubelita, Brazil. This tourmaline specimen is completely natural and has not been heated or treated in any way. It is a translucent natural crystal section with a reddish-purple core partially surrounded by green on two sides. Tourmaline Specimen Dimensions: 1.5" long x 1.3" x 1.1"
This natural specimen of watermelon tourmaline was mined at Rubelita, Brazil. This tourmaline specimen is completely natural and it has not been heated or treated in any way. It is a translucent natural crystal section with a deep reddish-pink tourmaline core partially surrounded by green tourmaline. See also an opposite side view of this natural tourmaline specimen. Tourmaline Dimensions: 2.7" long x 2.0" x 1.1"
This natural specimen of watermelon tourmaline weighs over 1/4 pound! 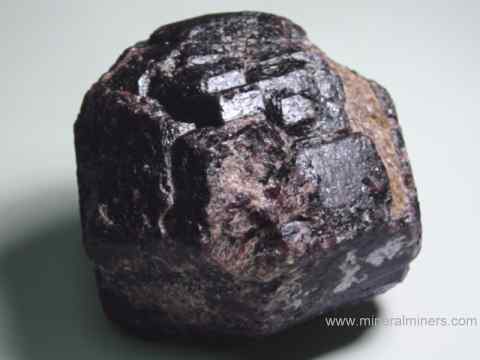 It was mined at Rubelita, Brazil. This tourmaline specimen is completely natural and has not been heated or treated in any way. 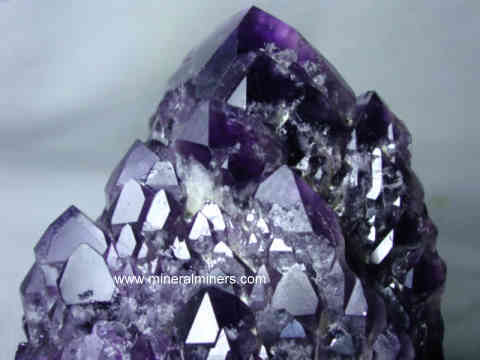 It is opaque to translucent and has mostly pink-purple color with black tourmaline and dark green tourmaline. Tourmaline Specimen Dimensions: 0.65" long x 0.6" x 0.55"
This natural mineral specimen of watermelon tourmaline was mined at Salinas, Brazil. It is completely natural and has not been heated or treated in any way. This is a superior lapidary grade semi-transparent tourmaline crystal section with a natural color pink tourmaline core surrounded by a green tourmaline rim. Watermelon tourmalines with this degree of transparency are usually sawn into thin slices and then polished. See another view of this lapidary grade watermelon tourmaline crystal. Tourmaline Specimen Dimensions: 1.1" long x 0.9" x 0.6"
This natural specimen of watermelon tourmaline was mined at Salinas, Brazil. It is completely natural and has not been heated or treated in any way. It is a commercial lapidary grade semi-transparent crystal section with a pink tourmaline core surrounded by green tourmaline. Watermelon tourmalines with this degree of transparency are usually sawn into thin slices and then polished. Tourmaline Specimen Dimensions: 3" long x 1.9" x 1.2"
This natural specimen of watermelon tourmaline was mined at Rubelita, Brazil. It is completely natural and has not been heated or treated in any way. It is a translucent natural crystal section with a reddish-purple tourmaline core partially surrounded by green tourmaline on two sides. See also an opposite side view of this natural color tourmaline specimen. Tourmaline Specimen Dimensions: 0.8" long x 0.9" x 0.75"
This natural mineral specimen of watermelon tourmaline was mined at Salinas, Brazil. It is completely natural and has not been heated or treated in any way. It is a lapidary grade semi-transparent crystal section with a natural color pink tourmaline core surrounded by a green tourmaline rim. See another view of this lapidary grade watermelon tourmaline. See also a different view of this natural color watermelon tourmaline. Tourmaline Specimen Dimensions: 3.9" long x 1.5" x 0.8"
This natural specimen of watermelon tourmaline was mined at Rubelita, Brazil. It is completely natural and has not been heated or treated in any way. It is a translucent natural crystal section with a reddish-purple tourmaline core partially surrounded by green tourmaline on one side with some lepidolite on the back. Tourmaline Specimen Dimensions: 2.2" long x 1.6" x 1.2"
This natural specimen of watermelon tourmaline was mined at Rubelita, Brazil. It is completely natural and has not been heated or treated in any way. It is a translucent natural crystal section with a deep reddish-pink tourmaline core partially surrounded by green tourmaline on two sides. See also an opposite side view of this natural tourmaline specimen. Tourmaline Specimen Dimensions: 3.6" long x 1.4" x 1.2"
This natural specimen of watermelon tourmaline was mined at Rubelita, Brazil. It is completely natural and has not been heated or treated in any way. It is a translucent natural crystal section with a reddish-purple tourmaline core partially surrounded by green tourmaline on two sides. Tourmaline Specimen Dimensions: 2.3" long x 2.1" x 1.4"
This natural specimen of watermelon tourmaline was mined at Rubelita, Brazil. This tourmaline specimen is completely natural, and it has not been heated or treated in any way. It is a translucent natural tourmaline crystal section with a deep reddish-pink tourmaline core partially surrounded by green tourmaline. See an opposite side view of this watermelon tourmaline specimen. See also an end view of this natural color watermelon tourmaline. Tourmaline Specimen Dimensions: 1.1" long x 1.7" x 1.4"
This natural mineral specimen of watermelon tourmaline was mined at Salinas, Brazil. It is completely natural and has not been heated or treated in any way. It is a lapidary grade semi-transparent tourmaline crystal section with a natural color pink tourmaline core surrounded by a green tourmaline rim. See an opposite side view of this lapidary grade watermelon tourmaline specimen. See also a view of this natural color watermelon tourmaline held up to a light. Tourmaline Specimen Dimensions: 2.7" long x 1.6" x 1.2"
This natural mineral specimen of watermelon tourmaline weighs 1/4 pound! 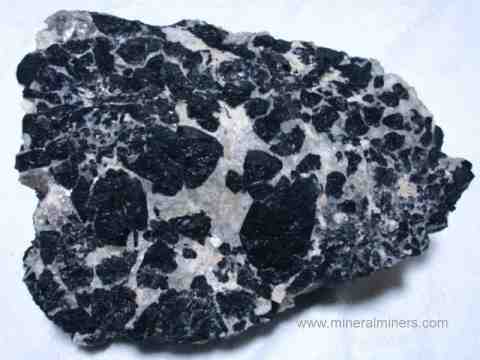 It was mined at Salinas, Brazil. 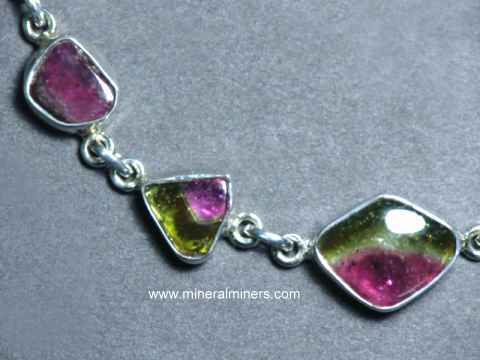 This beautiful waterlmelon tourmaline is completely natural, and it has not been heated or treated in any way. It is a lapidary grade semi-transparent tourmaline crystal section with a natural color pink tourmaline core surrounded by a green tourmaline rim. 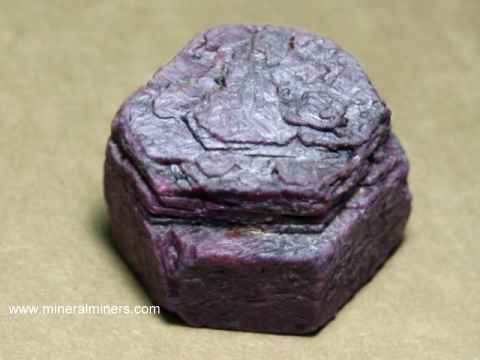 See an opposite side view of this lapidary grade watermelon tourmaline mineral specimen. See a view of this natural color watermelon tourmaline held up to a light. See also another view of this large watermelon tourmaline specimen. Watermelon Tourmaline Crystal Dimensions: 2" x 2" x 1.8"
Tourmaline Specimen Dimensions: 3.7" long x 2.6" x 2.4"
This natural mineral specimen of watermelon tourmaline weighs over one pound! 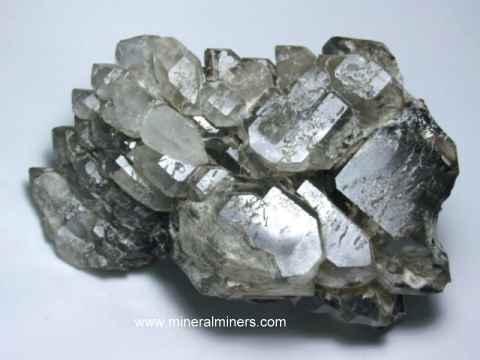 It was mined at Salinas, Brazil. This large waterlmelon tourmaline is completely natural, and it has not been heated or treated in any way. It is a lapidary grade semi-transparent tourmaline crystal section with a natural color pink tourmaline core surrounded by a green tourmaline rim. See another view of this lapidary grade watermelon tourmaline mineral specimen. See an end view of this natural color watermelon tourmaline. See also an opposite side view of this large watermelon tourmaline specimen. Natural pegmatite matrix specimen weighing 1.8 pounds! Pegmatite Specimen Dimensions: 4.6" long x 4.3" x 2"
The matrix of this natural pegmatite decorator specimen is white clevelandite (a variety of albite feldspar) with faintly blue-ish hues. This specimen is completely natural and has not been heated or treated in any way. There are a few dozen small green tourmaline crystals perched on top of the clevelandite. There also are two watermelon tourmaline crystals. See a full view photo of this natural mineral specimen of clevelandite with tourmaline. Our Green Tourmaline Crystals are all untreated natural color green tourmaline crystals! 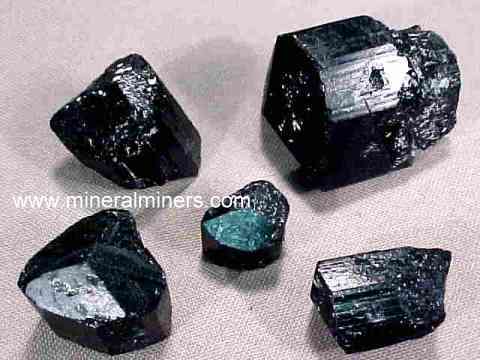 See also our page displaying dravite tourmaline. We have several different kinds of natural green tourmaline items in stock, including green tourmaline gemstones, green tourmaline crystals & mineral specimens, and a large selection of natural color green tourmaline jewelry items. Some of our green tourmaline crystals have rare gem grade areas inside and can be faceted into beautiful green tourmaline gemstones! Our green tourmaline bead necklaces are strung with natural color transparent green tourmalines, and our green tourmaline pendants are set in solid 14k gold designs with a variety of green tourmaline gemstone sizes and shapes to choose from. 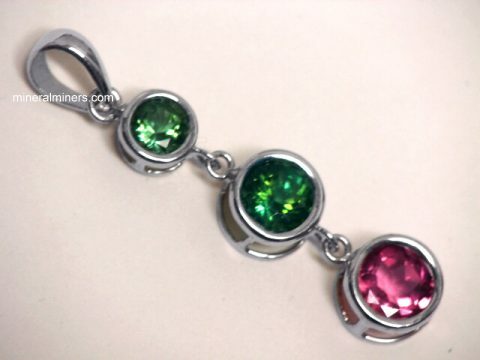 We also have a large variety of 925 sterling silver green tourmaline jewelry items. We have been mining for tourmaline crystals, garnet crystals, aquamarine crystals, tourmaline gemstones and other gems, crystals & minerals for more than 30 years, and we have a very large variety of natural crystals available in many different minerals. See our page with links to natural crystals of all mineral varieties! See also our page with links to all of our polished crystals. 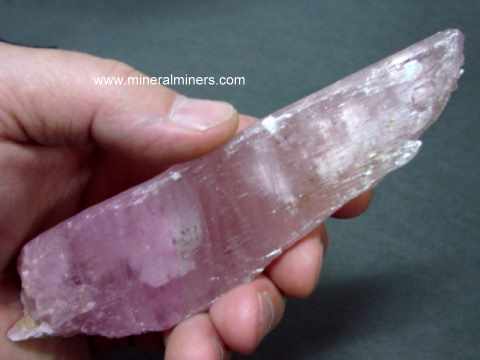 We also have a large selection of natural color pink tourmaline crystals and bi-color tourmaline crystals. We have naturally terminated crystals available in a very large variety of minerals including fine pegmatite crystal specimens. 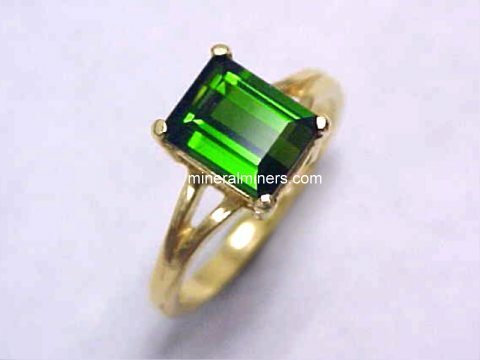 See also our natural green tourmaline jewelry. 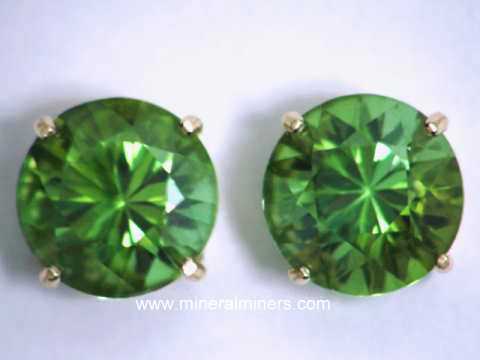 Be sure to see our selection of natural green tourmaline earrings. 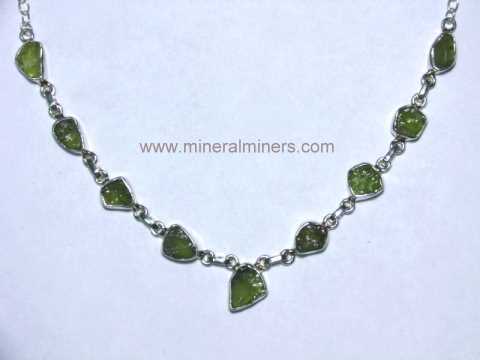 See also our pages displaying natural green tourmaline necklaces & green tourmaline rings. 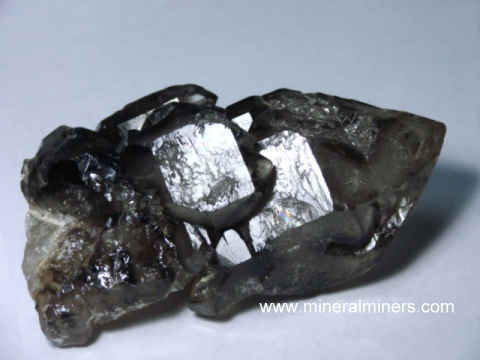 See our page displaying only black tourmaline products. 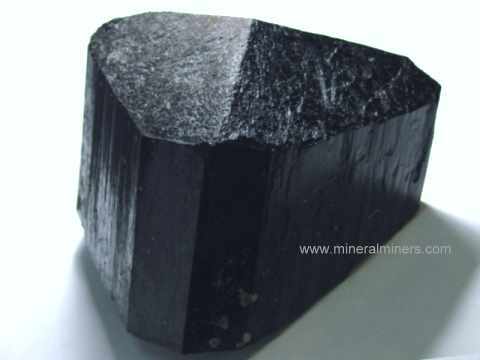 We have a variety of genuine black tourmaline products available including handcrafted jewelry items and also black tourmaline mineral specimens & crystals. Be sure to see our larger size black tourmaline decorator mineral specimens with black tourmaline crystals embedded in quartz matrix! Information about genuine Tourmaline and its history, physical properties, chemistry, occurance, and metaphysical uses is displayed on our tourmaline information page. 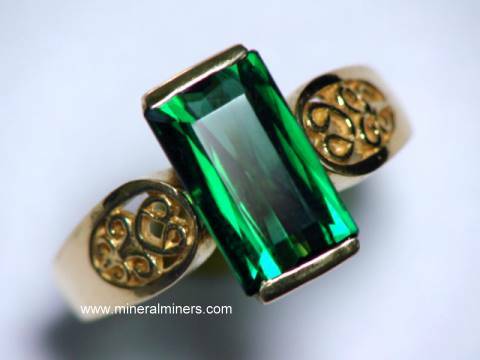 To see more green tourmaline photos, just select another linked image displayed below. Each of our tourmaline crystals is completely natural - just the way it was found in the earth. 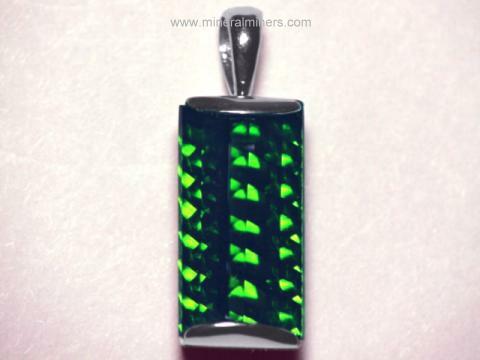 We do have additional green tourmalines in stock. Some of our rare quality green tourmaline mineral specimens and crystals also have gem-grade areas inside and can be used as superior grade green tourmaline gem rough. Be sure to let us know if you have any natural green tourmaline requests. 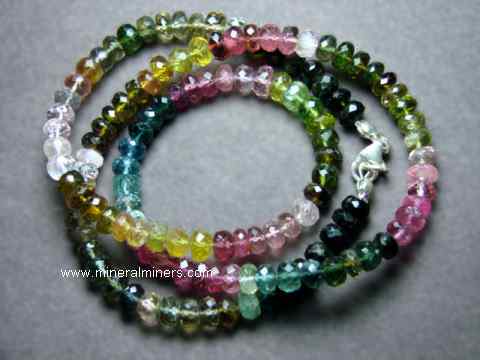 Would you like us to inform you when we add more natural color green tourmaline crystals on this page? Please contact our webmaster or our 'site' geologist with any comments or questions.